Colin recently moved back to the Bay Area from Maine. Colin began his teaching career at Spurwink, where he provided students in grades 4-8 with strengths-based, individualized academic and behavioral instruction. Colin is entering his second year as a 5th grade homeroom teacher at Sand Hill School. Colin was diagnosed as a dyslexic learner in 2nd grade and attended Charles Armstrong School. He earned a BA in Sociology and Criminal Justice at the University of Arizona, where he took advantage of the Strategic Alternative Learning Techniques (SALT) Center. Colin is an advocate of youth wellness and enjoys supporting the academic, social-emotional, and executive functioning skills of students at Sand Hill School. 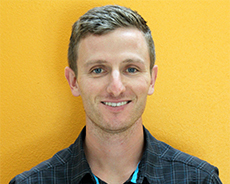 Colin is a Level 1 Certified Wilson Reading System (WRS) instructor, and is passionate about teaching his students effective decoding and encoding strategies. This year, Colin is excited to lead Sand Hill’s Riding for Focus program in partnership with the Specialized Foundation, Central Michigan University, and Stanford University. Riding for Focus is a cycling program aimed at helping students with learning differences such as ADHD achieve academic, health, and social success. Colin is an outdoor enthusiast and enjoys mountain biking, snowboarding, and hiking with his Labrador Retriever mix named Jane.